On March 22 & 23, 2019, businesses in the Heart of Brevard will once again host this new and growing annual event celebrating local arts & culture in downtown Brevard, North Carolina. ”Arts in March” will begin on Friday evening, March 22nd, from 5:00 to 8:00 p.m. The evening will be filled with open studios & galleries, artist and author meet & greets, menu specials at restaurants, live music at various locations, and more. On Saturday, March 23rd from 10:00 am to 6:00 pm, the festivities will continue with artist demos, art talks, talks by local writers, featured artists & crafts people, culinary classes, menu specials at restaurants, live music, and more. ”This event is a great way to kick-off spring and bring attention to all the great artists we having living right here in Brevard and Transylvania County. We continue to expand the number of arts and culinary businesses in the Heart of Brevard, and this new event has proven to be a great way showcase this. 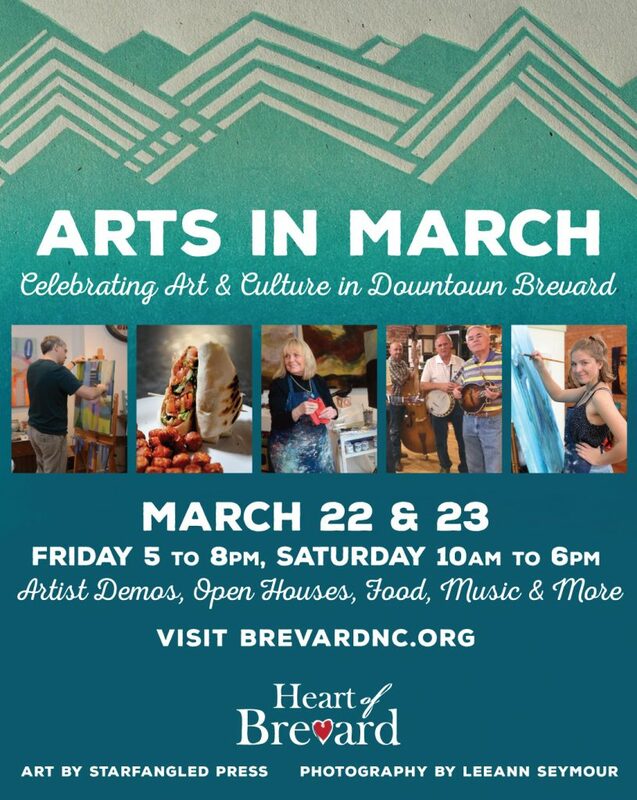 We are also hoping to reach outside of the district to other artists in the community and bring them into the downtown for the weekend by finding partner businesses to host them.” said Heath Seymour, Executive Director at the Heart of Brevard. This second annual event will focus on the variety of arts & culture available in downtown Brevard: visual, performing, writing, culinary, fashion, and other artistic endeavors. Known for its hometown feel, Brevard is a vibrant hub for the arts and the Heart of Brevard hosts a variety of other large annual festivals and special events throughout the year which also showcase other aspects of the creative culture found in this part of Western North Carolina. To download a map of Arts in March, with a listing of all the events at each business, gallery, and restaurant, please click here!